PART IV: 10 GREAT RACE TRACKS YOU’VE NEVER SEEN! 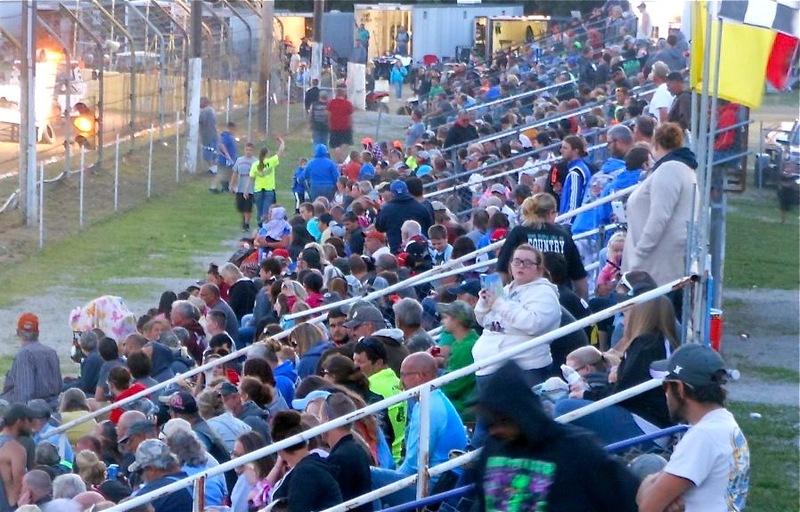 Stephen Cox blogs about a century of motorsports magic at Montpelier Motor Speedway. Indianapolis. Le Mans. Milwaukee. Those are the places that come to mind when discussing the oldest and most legendary racetracks on the planet. Montpelier is rarely mentioned, though it should be. Last weekend I discovered a small, dirt bullring in eastern Indiana that has been one of auto racing’s best-kept secrets for over a century. Built as a half-mile horseracing track in 1903, Montpelier Motor Speedway held its first automobile race on Tuesday afternoon, May 4, 1915. To put that date in perspective, it was just three years after the Titanic sank, two years after the infamous 16th Amendment was ratified (or not) and just three weeks before Ralph DePalma won the 5th International 500 Mile Sweepstakes at the Indianapolis Motor Speedway. That was a long time ago. That first race at Montpelier Motor Speedway featured a typical program for its day. Both motorcycle and automobile races were held on the original, half-mile dirt track. The program consisted of short events, ranging from 5 to 10 miles in length. This was a typical motor racing docket for the era. It was the 1915 equivalent of a modern circle track’s weekly program. The festivities were well attended, thanks in part to the convenient railway service that passed within walking distance of the track. The competitors were a sturdy sort, unfazed by the dangers posed by a long row of trees that lined the south edge of the track. Today’s quarter-mile clay oval was built inside the half-mile track in 1985. For a short time the facility served a dual purpose with horses training on the half-mile and auto racing held on the smaller bullring. The original half-mile track eventually fell into disuse. Much of it can still be seen from the air, including the ominous line of trees that stands along Turn 3 to this day (which, although deadly to competitors on the half-mile a century ago, is not a factor for their modern counterparts on the quarter-mile track). Today’s souvenir stand is in the middle of the original 1915 main straightaway. The old Turn 4 is now an open field where children fly frisbees and throw footballs during intermission. The railroad that brought so many early 20th century fans to the races still sits less than fifty yards from what was once a blistering fast Turn 1. Now owned by Harold and Lori Hunter, Montpelier Motor Speedway is a modern, well-run quarter-mile facility that I thoroughly enjoyed. 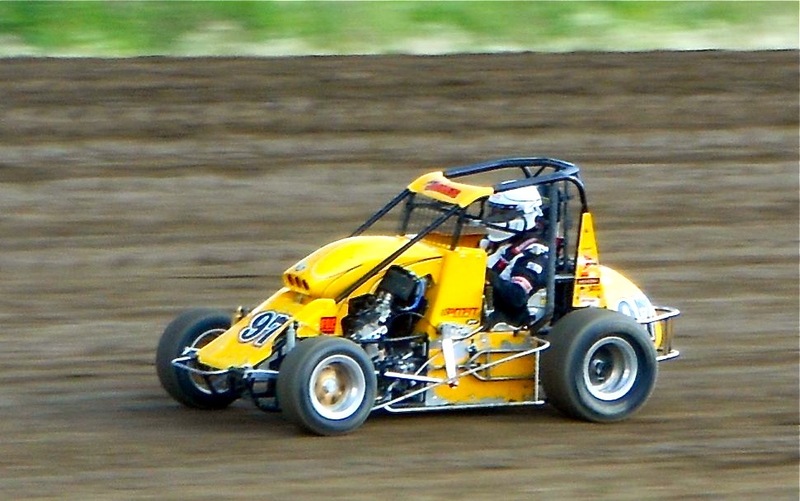 The weekly program offers typical fare including open wheel Modifieds, late-models, street stocks and four cylinder cars with an occasional visit from a midget or sprint car series. Ticket costs are modest and reasonable, usually running $12-15 per person, about one-third what a couple would pay for dinner and a movie in any major city. The restrooms are modern and clean by dirt track standards. The grandstand capacity is 3,200 people and at least 2,500 of those seats were filled during my visit. Clear protective glasses and earplugs are available at the souvenir stand for $2 each. The track doesn’t punish its customers or gouge prices for those who forget these dirt track necessities. A tenderloin sandwich with nachos and a Coke is available for about the same price as a super-sized Big Mac meal. Montpelier’s staff keeps the program running quickly and smoothly all night long. Race fans waited less than two minutes between heat races, including the time necessary for a pace lap. Other than the planned intermission prior to the feature events, the on-track action was almost non-stop all evening. 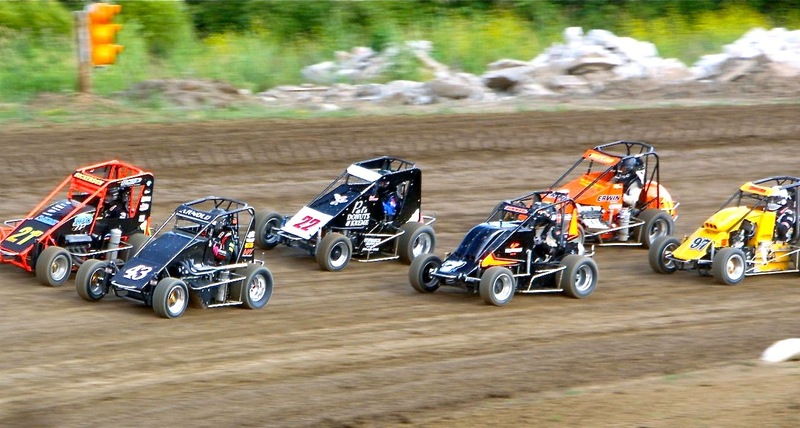 If you are a serious race fan who appreciates the history of the sport, a visit to Montpelier Motor Speedway is almost mandatory. 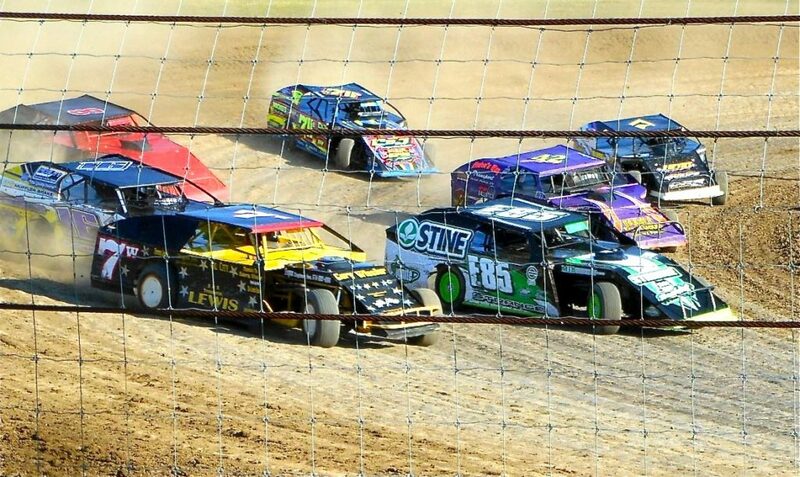 It is among the oldest operating racetracks in the world, and it still represents everything that old-fashioned dirt track racing is about. Put this one on your bucket list.